This results in 6552 data points that require printing at 50 data points per page. render (puts a copy in the directory even though "file save" instructions feature not working). back to top of loop for next page select data and build chart, etc. These eventually have to be PDF and each image is rendered at 1000x600. After just 14 (137 printed pages required for this 8 mile survey), I get this.. I do not have an option for blob in database or text file of just image data (which probably would not work either if TeeChart still has to render the data out -- which is where the memory accumulates) and the SVG is not working to play with that (like I said, they eventually have to go to single PDF and it may be possible to save the image data in a way that PDF can be built rather than saving PNG or JPEG) -- but again, those options are not available. So why is not the memory relieved (imagedestroy) after each render? The image memory accumulates and crashes, how can this be relieved to start each chart fresh at top of loop with no memory of the one before? Please, try to arrange a simple example project we can run as-is to reproduce the problem here. 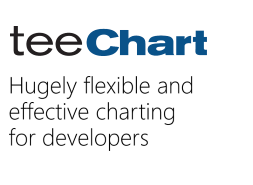 Also, pleas specify what exact TeeChart build are you using. Below is code from the same TeeChart example I used in the image width thread but with a button, a WHILE loop, and image size of 1000x600 px. I get 14 images before crash. THe on screen result will look like below, and in whatever directory this page is run from, the images will be there numbered. An increase to 128M in TChart.php will increase the number of renders to 35 before memory crashing -- but I had to throw a progress bar into the loop or it times out around 32. Still needs to have the stream memory restored after each render somehow. Coupled with the memory allocation increase and getting the file save feature fixed so the images can be directed to specific directory would be a start. Then I still have to create the mechanisms for collecting them from directory and compiling into a single PDF. you're correct, I'm improving the code to release all the memory once the Chart is rendered, or object with same name is recreated. I'll back to you with the fixes as soon as possible. We've just published a new maintenance release with the fixes Pep mentioned above.